Despite it being the shortest month of the year, U.S. coal exporters were able to add to the already high levels of U.S. coal exports, shipping out 9.7 million tons of coal in February 2018, extending the +9 million tons of exports streak now to seven consecutive months. Increases in met coal exports were the main driver behind the strong performance, as East Coast met coal shippers continue to work through a backlog after cold weather disrupted the export supply chain during the beginning of 2018. 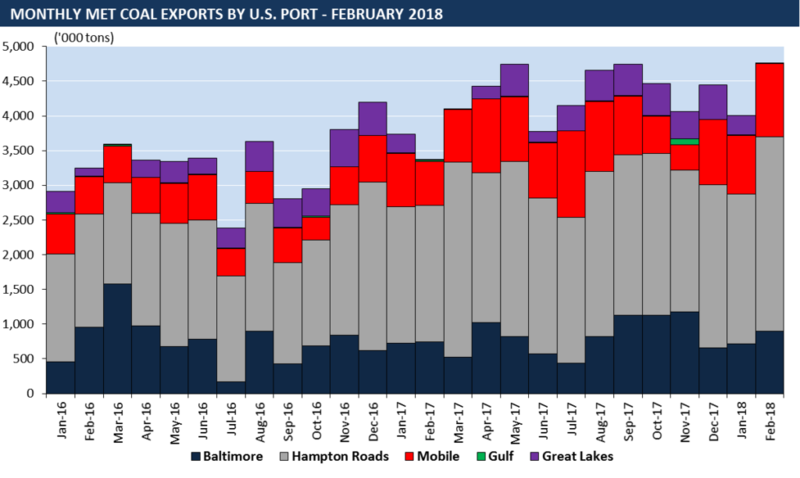 As previewed in last month’s EVA Coal Trade Report, Eastern U.S. coal producers and shippers are working through a significant backlog of metallurgical coal that accumulated in January as the cold weather along the East Coast considerably disrupted the met coal supply chain to export terminals. With much warmer-than-average weather in February, all three major East Coast coal terminals were able to increase their met coal exports by 25-30 percent over last month. U.S. coal producers exported more than 4.7 million tons of met coal in February, an increase of 19 percent over last month and on pace of topping 52 million tons of U.S. met coal exports for the year. During the shortest month of the year, U.S. coal suppliers exported just under five million tons of U.S. steam coal in February, the first sub-five million month since September of last year. 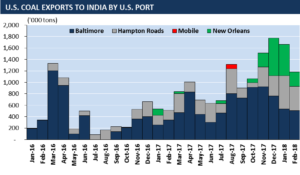 Most of the 600k ton decline in exports over last month comes from the drop of Illinois Basin coal exports through New Orleans, as Indian and Mexcian coal exports through NOLA decreased by 553k tons collectively. Overall, U.S. steam coal exports to India fell 42 percent to 631k tons as India reduced coal imports amid high inventories after the recent period of “over-buying” in December and January. However, Indian coal imports are expected to remain high as the local coal producer Coal India Ltd. continues to fall short of its 2018 production goals. For more detailed information on monthly U.S. coal exports, please subscribe to EVA’s Monthly Coal Trade Report.